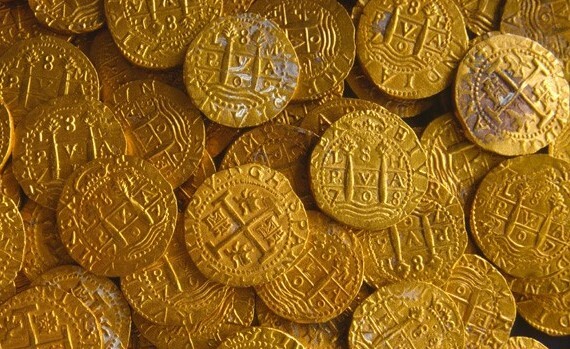 We are specialists in Peruvian, Mexican, and Colombian gold from the Florida shipwrecks of the 1715 Fleet. We offer Spanish Colonial gold & silver from Mexico City, Lima, Cuzco, Potosi, Bogotá, Cartagena, and Santiago de Chile. Oro & plata corriente when available. Welcome to Goldcobs.com. Our current inventory is here. 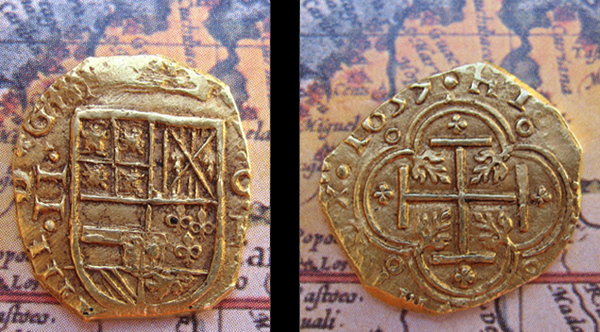 New this spring, several mint state Lima, Cuzco, & Mexico escudos with 1715 Fleet provenance. 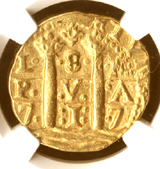 From Mexico, a selection of Fleet 1711-15 escudos displaying the novel Altamira reverse designs. From Lima in the post-Fleet era, the finest known example of the ephemeral "Tearful Cross" design in 1716-17 here. 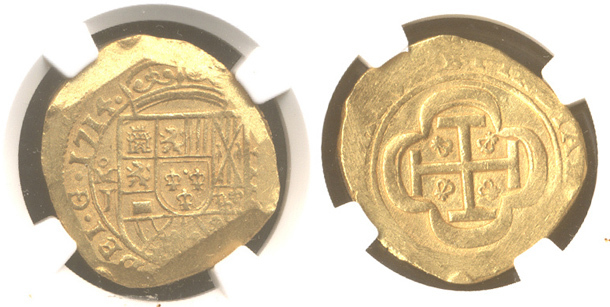 A one-known Lima 1736/5 here two escudos joins a one-known 1737/6 one escudo here, as we continue to explore the unstudied and extremely rare gold issues of Philip V's second reign. Many thanks to those who attended our first conference on the 1715 Fleet. Our second conference on the Fleet occurred at St. Augustine on March 16-18, 2017. Last fall we spoke on the 1711-12 Mexican gold coinage at the annual US Mexican American Numismatic Conference in Scottsdale. Video should soon be available. We will regularly be attending the October USMEX conference in Scottsdale. Please join us if you can. Now available on our sister site, www.1715fleetsociety.com, 1500 high-quality images of the magnificent Florida State Gold Cob Collection. Enjoy! 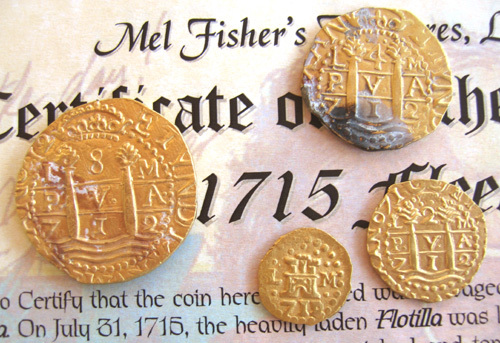 Those of you interested in gold and silver cobs recovered from the 1715 Fleet might enjoy the cover article we did for the January 2015 issue of the Numismatist. Our study of the varieties of the 1714 Mexican onza is recently published in the Journal of US Mexican Numismatic Association, where our study of the Mexican gold coinage of the 1700-1713 Mexican gold coinage is forthcoming. 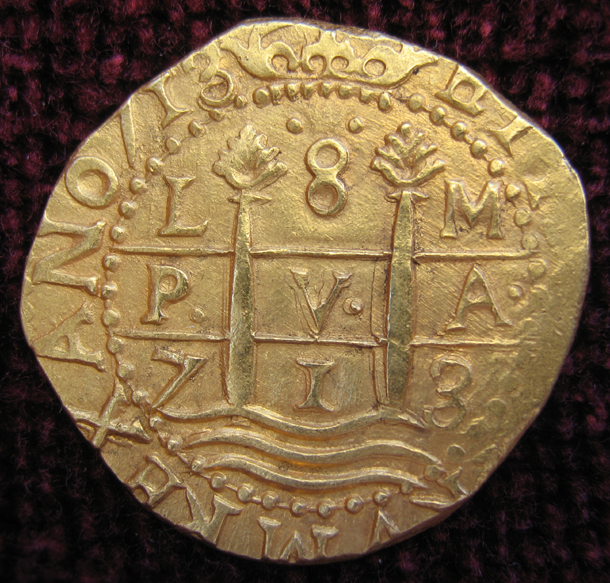 If gold cobs, shipwreck or otherwise, are not to your liking, we also offer some fine cob and portrait eight reales. From a research collection we offer some very rare 1620's Cartagena reales (soon to have the benefit of a new study by Proctor and Blanton). 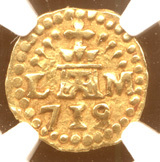 Please visit our Master List page for links to several choice mint state, mostly prooflike Mexico and Potosi 8 reales. The Aymara Hoard pieces are exceptional. 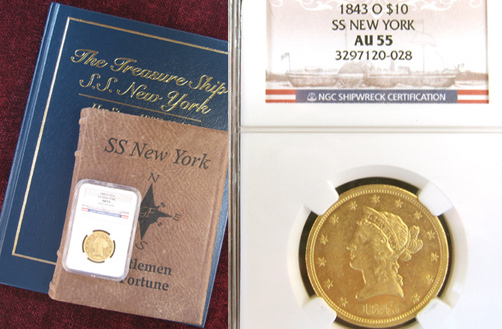 We also continue to try to acquire choice shipwreck US gold & silver from the SS Republic, SS New York, and SS Central America. A gem 1857 S from the SSCA was recently added as well as a 1857 S double eagle very rare from the SS Republic. 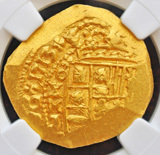 We at Gold Cobs want to educate you about the coins that you are interested it. We will show you the best photos our modest photographic skills permit and give you in-depth, comprehensive descriptions of the coins and their history. Take your time and feel free to ask questions. Explore our website. Whether you are an advanced collector hunting rarities, or someone just beginning to plan his collection, there are some things here that we hope will interest you. We try to maintain a good selection of Lima gold cobs, mostly from the 1715 Fleet, but also from Nuestra Senora de la Luz. The full list is here. The 1713 onza pictured above sold recently. 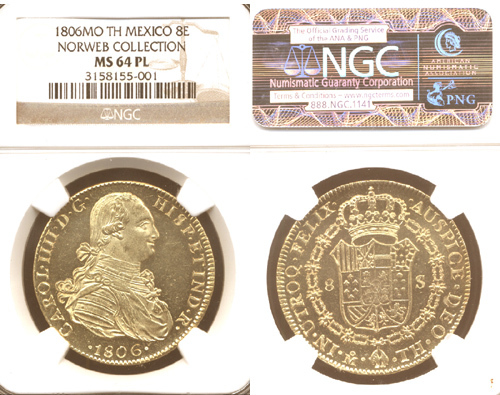 We specialize in Mexico 8 escudos 1711-15 from the 1715 Fleet. This remarkable MS64 Fleet 1714 onza is the highest graded Mexican onza for 1714 or any other date [sold]. 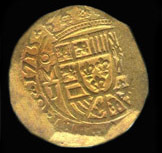 The discovery 20 years ago of the wreck of Nuestra Senora de la Luz has revolutionized our understanding of the last years of cob coinage at Lima. 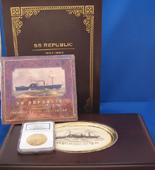 Previously uncollectible issues like the 1750 onza and media onza are now available if rare. 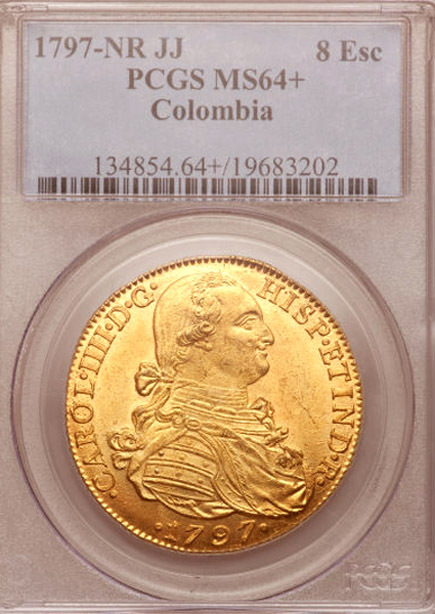 Many mysteries remain, such as why the biggest 4 escudos issue in the history of the Lima mint occurred in the last months of 1750. One Luz Lima is here, but others are not yet listed. Please inquire. terravitan@aol.com or 480-595-1293. 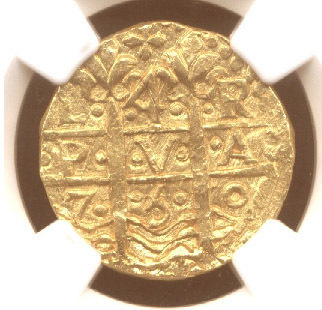 Rare Colombian gold cobs from the Cartagena mint like this 1633 CE are here. A dozen years before Mexico City opened its first mint Cortes and his Conquistadors were melting Conquest treasure and casting it into crude ingots at make-shift field foundries. All of these ingots were recalled in the late 1520's and none were thought to have survived--until a wreck was discovered on the Los Mimbres shoals, a wreck of a ship that had sailed from Mexico in 1527-28. About 160 "golden silver" (dorada plata) ingots were recovered from the Los Mimbres wreck. 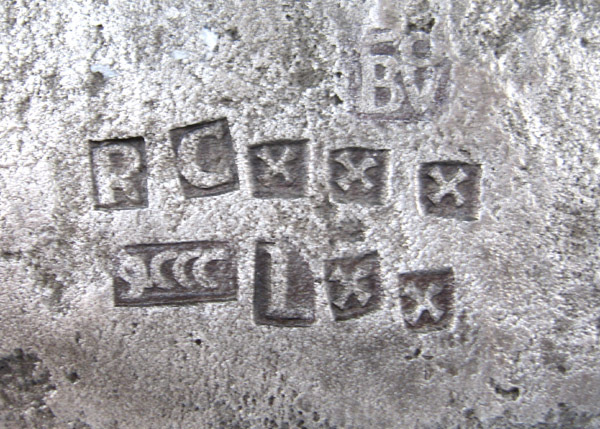 Pictured above are the markings on one of these bars (M36), which tell us this bar was cast in Tarascan Michoacan, Mexico, in 1523-24 by one of Cortes' trusted veedors, Bernardino Vazquez de Tapia (Bvo). More of the story and some ingots for sale here (none currently available). Our Portrait 8 and 4 escudos are here . This deep cameo-prooflike onza is one of the most attractive Mexico eight escudos I have seen. It pedigrees to the 1985 Norweb sale in Dallas where I was an unhappy underbidder. 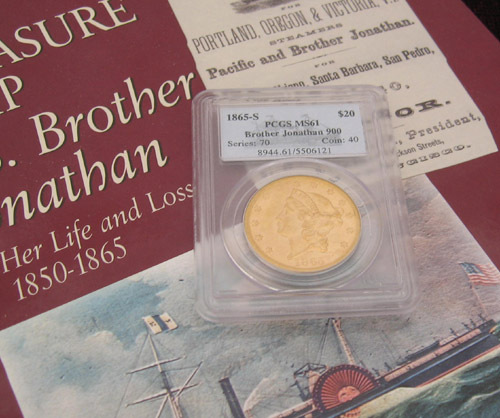 It resembles a piece of modern proof gold, yet it was a production strike at Mexico City 205 years ago. SOLD. This spectacular deep prooflike Mexican 8 reales was the best Charles III eight reales that the money-is-no-object Millennia Collection (lot 1098) could locate. At auction it beat its estimate by more than three times. Available here. We try to maintain an inventory here of choice US gold & silver from the SS Central America, SS Republic, SS New York, and SS Brother Jonathon. Most pieces sell immediately to want lists. Please email or call us with your want list. This 1843 New Orleans eagle from the SS New York, the second best found on the wreck. ©2016 Goldcobs.com All Rights Reserved.